Its Ancient Origins The originality of Polish culture is tied to its language and to its Slavonic roots. Linguistic studies indicate that 5000 to 4000 years ago early Balto-Slavic languages were part of the Arian or the Eastern Indo-European languages. Over 3500 years ago, the languages of the Balto-Slavs separated from the Arian languages; some 3000 years ago, the Baltic and Slavic languages separated from each other; and for the next 1500 years, the Slavic languages evolved parallel to the Greek, Latin, Celtic, Germanic, and other languages. The evolution of the Polish language occurred during the following 1500 years. Polish language reflected the intellectual and material culture in spoken words and later in literature. Early Polish vocabulary contained much earlier cultural information than do written records. The adoption of foreign words grew with the passage of time. During the present information age, new European and American terms related to fashions, sports, arts, politics, and technology are being adopted by the modern Polish language. Unabridged Polish dictionaries presently contain some 200,000 entries; one-third of these are foreign adaptations, while about one-fourth are still close to Old Slavonic words. Although Polish was the national language of Poland, the influence of the Roman Catholic Church introduced Poland to Latin - the lingua franca of western European culture. Polish translations of Latin texts and other Polish publications were the only source of the eastern Slavic peoples' knowledge about Western civilization. Thus were nearly all ruling members of the Russian Romanov Dynasty (1613-1917) were fluentin Polish. The name of Poland, in Polish "Polska," originated from the name of Polanians. Linguistic data of the highly diversified early Slavic vocabulary proves familiarity with elaborate abstract ideas. In Slavic self-perception the ethnic meaning of the word "Slav" or Slowianin (swo-vyah-neen) in Polish was derived from the term for the spoken word, or "slowo" (swo-vo). Thus, to the Slavs, their name testified totheir mastery over spoken words, in contrast to others, whose languages they did not understand. The chronicle of the Cistercian abbey at Henryków (1227-1310) includes the oldest preserved sentence written in Polish. A constitutional monarchy evolved in this period (1370-1493). During this evolution, due legal process was established in Poland; Polish became a language of elegance and civility in east central Europe, as Poland acquired a civilizing role between the Baltic and the Black Seas and Polish was used as the language of diplomacy. By the end of the 15th century, national and regional parliaments became catalysts of social and cultural life in Poland - a role played in the rest of Europe by the royal court and the town. The first Digest of Polish Law was printed in Kraków in 1488; it included a royal guarantee against searches and seizures. Approximately 15,000 different Polish words were used in the preserved medieval texts. During the reign (1492-1501) of King Jan Olbracht (1459-1501), son of King Kazimierz IV, the Polish parliament became bicameral in 1493. Thus, the year 1493 marked the maturity of the Polish Constitutional Monarchy. The Bicameral National Parliament the Seym Walny (seym val-ni). It defined itself as three estates: the king, the senate, consisting of bishops and dignitaries, and the lower house or the Seym proper. It was called the Izba Poselska (eez-ba po-sel-skah) or the Chamber of Deputies. It was presided over by a speaker called the Marshal, while the Senate was presided over by the King. It was an important step in the indigenous Polish development of the representative form of government, which lasted uninterrupted 300 years until 1795. The period of Polish Constitutional Monarchy (1493-1569), was followed by the First Polish Republic starting in1569. The Old Republic lasted until 1795, when the international crime of destruction of the Polish state was committed. The year 1493 marked the beginning of 160 years of successful parliamentary activity of the Seym. During this period a proverb was coined: Polska nie rzadem stoi ale cnota , meaning that Poland stands not by government but by the virtue of its citizens. Each deputy to the Seym represented his own region and theoretically was obliged to veto legislative proposals that violated his mandate. When unanimity was not achieved, the less important matters were postponed while urgent matter was attended to by persuasion or by forming a confederation in which majority ruled. Polish parliamentary success lasted until 1652, when a crisis was caused by the first use of a veto power (Liberum veto): a deputy was allowed to break the rules of Polish parliamentary procedure by an anarchistic speaker. In 1494 an act of the Seym ratified the incorporation of the Duchy of Zator and Oswiecim into Poland. It also confirmed the local laws of Prussia. In 1504 was a victory of the middle nobility in the power struggle with the aristocracy. The Seym placed crown estates and properties under a partial control of the Chamber of Deputies. No person was to hold more than one office. The office of the grand hetman was defined as that of the defense minister and the administrator of the armed forces who also was to serve as the head of the military court. In 1505 the Constitution Seym of Radom passed the first Polish constitution called Nihil novi or "nothing new about us, without us," meaning that nothing new would be decided in Poland without concurrence of the Chamber of Deputies. The Chamber of Deputies was composed of representatives of the provincial legislatures or the regional or county diets known as the Seymiks. The new constitution prohibited the political nation of free citizens to occupy themselves with commerce and crafts under the penalty of loss of their civil rights. The first constitution of 1505 made the Chamber of Deputies of the Polish parliament the supreme power in Poland. The kings, elected for life, became successive heads of the state and chiefs of the executive branch of the Polish government. Starting in 1507, the laws passed by the Seym were published in Latin at the end of each session under the title of Constitutions. Latin of the Seym record was replaced by Polish in 1545. The Union Act by the Seym of Lublin (1569), made Poland and Lithuania formally one country, which was to elect one head of state and chief executive with the title of the king crowned in Kraków; the supreme political power was to reside in one national parliament, the Seym Walny, meeting in Warsaw. The role of the Seym became that of a "guardian of freedom" supervising the actions of the King. The united country was to have one currency and one foreign policy; the Poles, Ruthenians, an Lithuanians were to be free to settle anywhere in the Republic. However, identical but separate territorial offices, treasury, and army would remain. On July 1, 1569, the formal proclamation of the Union Act was made by the King Zygmunt August Jagiello czyk (1520-72). The First Polish Republic had the most numerous citizen soldiers in Europe. The conclusion of the union represented a unique act on the European scene. It resulted in peaceful and voluntary federation, which made one out of two separate states. The role of the Seym's became that of a " guardian of freedom" supervising the actions of the King, who was to be elected to serve as the chief executive of the Republic. The Seym was made up of three estates: the deputies representing the masses of the nobility and the major towns, the senate composed of the senators ex-officio, and the elected king. Warsaw became the permanent seat of the national parliament, the Seym Walny (seym vahl-ni). Renaissance brought interest in history, geography and customs. It influenced the publication in 1551 of the Chronicle of the World by Marcin Bielski (1495-1575). It became the first textbook of world history written in Polish. During Renaissance and up to the Enlightenment Kraków was the leading center of printing in Poland, both n quality and in quantity. Mikolaj Szarffenberg invented portable "camp-printer" for publication of proclamations and mandates during king's travel. A political program, republican in nature and advanced for its time,was published in 1551 under the title of Commentariorum De Republica Emendada by Andrzej Frycz Modrzewski (1503-72), called the father of Polish democratic thought." Modrzewski 's work wascomposed of five books: On Customs, On Laws. On War, On the Church, and On Schools. He called for the legal equality of all; for ending the oppression of the serfs and the inadequate laws to protect them; it was pacifist; it opposed all wars and schemes of aggression. Modrzewski advocated a strong central government, strictly controlled by laws; an efficient administration, and an independent court system to guarantee social justice. He also advocated a high quality education independent from the Church. He was one of the pioneers of the European science of government and laws. (His works were translated into German, French, Spanish, and Russian and were reprinted throughout Europe to be especially praised during the period of Enlightenment ). The flowering of Polish literature. Polish literature was flowering. Some of the greatest poetry of all times was created by Jan Kochanowski (1530-1584). He was the first to use a sophisticated and artistically perfect language. He reached lyrical perfection in a collection of 300 poems of various length. He wrote on political subjects suited to the times. Pose was written in beautiful Polish by Lukasz Górnicki (1527-1603). He published in 1566 Dworzanin Polski (The Polish Courtier). It is an adaptation to Polish conditions of an Italian work by Baldassare Castiglione, Il Cortegiano (1528). Górnicki wrote a critical political dialogue Rozmowa Polaka z Wlochem ( A Dialogue between a Polea and an Italian). In it he criticized the notion of the Polish "Golden Freedom." Polish was made into a medium of refined literary expression. Polish writers also contributed to reforms in orthography. Republican political writings in Latin continued. However, starting in the middle of the 16th century Polish displaced Latin in public life. Also majority of sermons were delivered in Polish. Religious polemic were carried in Polish and Polish Protestants used Polish in their schoolsto much greater extent than did the Catholics. Wawrzyniec Goslicki (1530 - 1607) published in 1568 De Optimo Senatore a program for Polish republican system based on a pluralistic society with perfect equilibrium between power and liberty. He defined the responsibility of the King as a head of state and a chief executive officer. He wrote about people's right to the pursuit of happiness. His work was translated and published three times in England starting in 1568. Its English title was "The Counselor Exactly Portraited". Each printing was banned and confiscated; William Shakespeare (1564 - 1616) gave the name of "Polonius" (a Pole in Latin) to the chief counsellor of Hamlet, a man who tried very ineptly to follow Goslicki's program. 150 years later The Counselor was highly praised by Sir Robert Walpole (1676 - 1745). Jan Maczynski published the first extensive Latin-Polish dictionary Lexico Latino-Polonorum in 1564. A pioneer of cardiology, a professorof medicine and philosophy, Józef Strus (1510-1568) published a 1555 treatise on the pulse entitled Sphygmicae artis libri quinque. In 1583, Andrzej Patrycy Nidecki edited and published the partially preserved writings of Cicero. His Fragmentorum M. Tulli Ciceronis was very popular among European humanists. Printing houses were also opened in provincial areas. Polish orthography was standardized chiefly by printers who helped the development of the Polish language by encouraging the publication of Polish books and dictionaries. A Polish grammar book for foreigners was printed in 1568 by Piotr Stratotius-Stojenski; his book was in French. During the first one hundred years of Polish printing some three-and-half million books were printed. By 1550, printers in Kraków had reached the highest European level. Widespread polemics on the religious questions in Poland often resounded throughout Europe. Protestants contributed to the wider use of the Polish language. Mikolaj Rey, called the father of literature inthe Polish language, first wrote moralizing dialogues published in 1543. In them he criticized overspending, luxury, and drunkenness. He wrote the best 16th-century Polish satire and gave an excellent picture of everyday life in Poland. His Life of an Honorable Man gave a vivid picture of the customs of Polish country squires. The Great Scientific Dictionary of Polish-Latin-Greek by Grzegorz Knapski, entitled Thesaurus Polono-Latino-Graecus, was published in 1621. It was an important work for Polish and Slavic lexicography. The first printing shop in Warsaw was established in 1624. Polish dictionaries, grammars, and other books were printed in Królewiec (Koenigsberg) in the Polish Fief of Prussia. 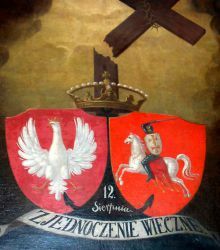 Enlightenment in Poland in the 18th century brought further advancement in the development of the Polish language, literature, and press during the reign of King Stanislaw II Poniatowski. Development during the 19th and 20th c.
The first complete dictionary of recent Polish was published in six volumes in 1807-1814 by Samuel Bogumil Linde (1771-1847), a lexicographer who worked at the Zaluski Library - the first public library in Europe. At that point, the Polish language was as equally developed as the German and more advanced than the Russian; it was one of major European languages possessing a rich literature and a vocabulary of arts and sciences. The character of Linde's dictionary was historical and not normative. It included 60,000 entries. In 1861, the learned circles of Wilno published Slownik jezyka polskiego (A Dictionary of the Polish Language), sometimes called The Wilno Dictionary. It included many regional words from north-eastern parts of Poland and is proof of a strong cultural connection between the Wilno region and the rest of ethnic Poland. The reform of the orthography of the Polish language was completed in 1891. Following its inauguration of Prace Filologiczne (The Philological Studies) in 1885, the Kraków Academy of Learning begun to issue two other publications: Poradnik Jezykowy (The Language Handbook)in 1901, and Jezyk Polski (The Polish Language) in 1913. In addition, theAcademy of learning published Slownik Gwar Polskich (Dictionary of Polish Dialects) from 1900 to 1911; and in 1915, Jezyk Polski i jego historia (The Polish Language and Its History) - two volumes of the Encyklopedia Polska. Another reform of Polish orthography was carried out in 1918. Polish literature blossomed. Adam Asnyk wrote poetry linking the Romanticist traditions with social problems viewed in a Positivist manner. Adolf Dygasinski wrote excellent naturalist novels about animals. Eliza Orzeszkowa, writer and journalist, wrote tendentious positivist literature; her best and most famous novel was Nad Niemnem (On the Shores of Niemen, 1887). Boleslaw Prus (Aleksander Glowacki, 1847-1912) was a writer and columnist of the period of realism. In Lalka (The Doll, 1890), he described the "last Romanticists" and the defeatof the positivist "dreamers." Henryk Sienkiewicz (1846-1916) wrote Polish historical novels. His novel, Quo Vadis, about early Christians in Nero's Rome won him a Noble Prize (1905) and was by far the greatest bestseller worldwide at the time. Total of about twenty people born in Poland won the Noble Prize for their contribution to science, literature, and peace. Thus, Polish language and culture are of considerable importance today, flourishing as they do in the geographical center of the European continent.